From August 2017, Jeju Island implemented a new city and intercity bus system. It increased the number of buses in service, while simplifying the routes, fees and numbering system. Consequently, the contents of this previously published blog post may have changed. We therefore would kindly request that you consult this page for new bus maps in English on VisitJeju.net, and this page on our blog for a chart of the old and new bus route numbers. If you read Korean, then the province’s official bus system website is a useful and up-to-date resource. We hope you’ll enjoy your travels on Jeju Island! This article on Jeju themed travel programs was originally published on our VisitJeju.net site. Please click here for the original piece and maps to the sites mentioned. — Ed. In April 1948, an historical event kicked off years of internecine conflict that wracked Jeju and its people to the core. The official account of the incident, also referred to as Jeju 4.3, states that a demonstration by islanders on March 1, 1947 turned violent, with some of the protesters being fired upon and killed by police. Discontent with the interim military government in Seoul grew until it boiled over on April 3, 1948 and martial law was declared. This state of emergency was not lifted until Sept. 21, 1954. During this time, an estimated 30,000 people, or 10 percent of the total population of Jeju at the time, were killed by military and police forces, or in some instances, due to longstanding personal feuds. The effects of this trauma are still felt today. This beautiful location is both peaceful and disquieting. It is a graveyard for some 14,000 victims, many whose bodies were never found. 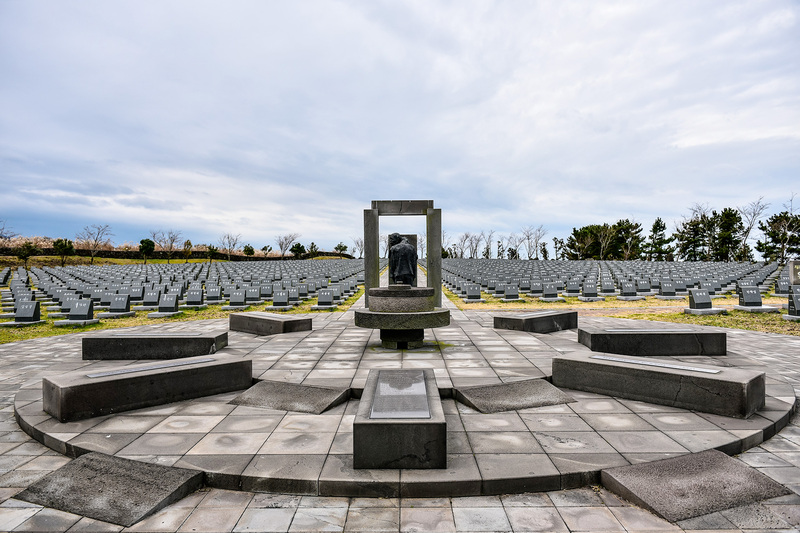 Here people of all walks of life come to remember and honor their loved ones and the victims and to learn more about the history of Jeju in the 20th century. The Jeju 4.3 Peace Park was built to keep that history alive. 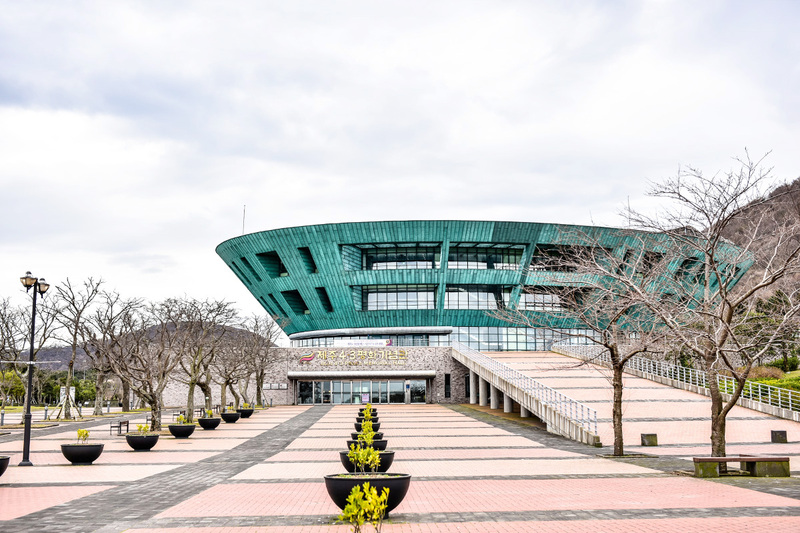 There are a number of informative exhibition halls for visitors to walk through and explore an overview of the geopolitical events that led up to the April 3rd Incident and its aftermath. The entire park is about 350,000 square meters, and visitors are encouraged to walk around the grounds after they’ve visited the hall and contemplate what they’ve learned about 4.3. A 4.3 Special Law was passed in the year 2000 which stipulated that land on Jeju would be acquired for the park and that a museum and other facilities would be built there. This plan was realised promptly and the park opened to the public on March 28, 2008. In addition to the museum and memorial hall, the park has facilities for 4.3 related art exhibitions and various conferences on the topic. The objective is to keep the memory of the victims and events alive, so that such tragic events never happen again. The word “peace” in the Jeju 4.3 Peace Park is extremely important to everyone involved. Public transportation From Jeju Intercity Bus Terminal catch bus 720 and get off at the Keundongne bus stop, transferring to bus 43 for the Jeju 4.3 Peace Park Entrance bus stop. The total travel time is about 41 minutes. Bukchon is along the northern coast east of Jeju City. It is small and quiet, but during the April 3rd Incident was the site of a large massacre in which some 400 people lost their lives. Now, the Neobeunsung Sacred Memorial for Victims of Jeju 4.3 stands as a solemn reminder of what happened in this otherwise peaceful spot of the island. ​The Memorial Hall serves as an expression of the pain of the villagers, but it also serves as a place to educate the next generation about the events that transpired there. There’s a exhibition space, a video room, a meditation room, and other facilities for this purpose. On the large stone memorial are written the words “Co-existence, Peace, Prosperity”. It’s up to us to ensure that this sentiment comes to fruition. ​Public transportation: From Jeju Intercity Bus Terminal catch bus 701 and get off at the Bukchonri Haedong bus stop. The total travel time is about 44 minutes. This volcanic cone is shaped like a mother’s skirt, which is quite appropriate as the creation myth for Jeju Island refers to Grandmother Seolmundae. The name Darangswi, too, is an old Jeju word for beautiful moon. This oreum is 382.4-meters-tall, much more diminutive than Hallasan Mountain’s imposing 1,950 meters… and yet its beauty has led islanders to consider it “the Queen of the Oreum”. Its graceful appearance is perfectly in keeping with this name. ​Unfortunately, it too was the site of a painful time in the island’s history. Around 20 households were destroyed, and the survivors fled to a small cave on the side of the volcanic cone. There they lived in secret, foraging for food, including oysters found nearby at the ocean shore. They were eventually discovered and fires lit at the entrance to their safe haven extinguished their lives. This sad story was eventually revealed some 44 years later, when in 1992 oyster shells from their time in hiding were discovered. The skeletons of 11 people, including children, were exhumed and cremated. Today this peaceful place is filled with pleasant wildflowers — but amid this disarmingly beautiful backdrop we must be sure to keep their memories alive. ​Public transportation: From Jeju Intercity Bus Terminal catch bus 710 and get off at the Gasinamdong Entrance, Yongnuni Oreum bus stop. The total travel time is about 1 hour 31 minutes. Baekjoilson means “One hundred grandfathers, one grandchild”. These words hint at the integral nature of our communal character. It also has a painful meaning for Jeju and the April 3rd Incident. Those who survived had to make new lives for themselves, all in the shadow of tragedy and while grieving for one’s lost loved ones. In the midst of the April 3rd Incident, the Korean War broke out on June 25, 1950. This compounded the nightmare of 4.3. All around the island at Seogwipo Port, Jeju Port, Jocheon air field, and Seotal Oreum, among other places, thousands were taken away on the suspicion of being enemies of the state, and shot. At Seotal Oreum, the bodies of 250 massacre victims were eventually found. The victims were never forgotten, though. In April 1957, just six years later, relatives gathered at the spot and identified their loved ones. 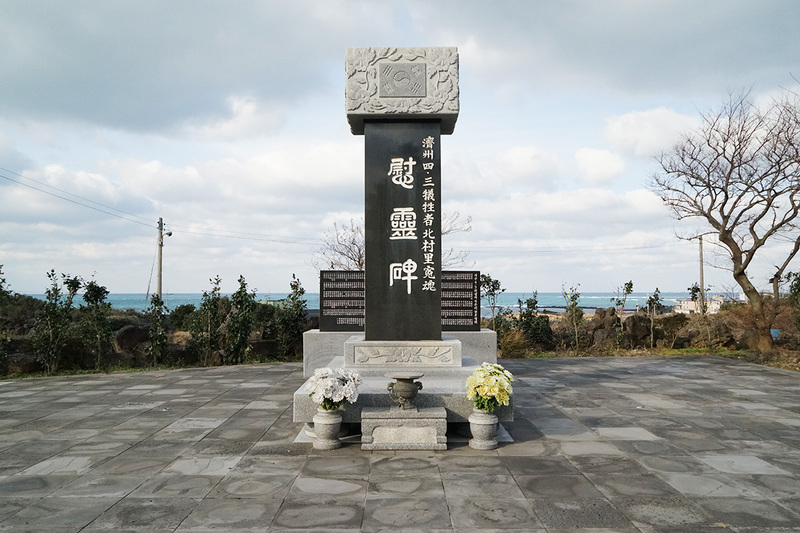 In the end a cemetery at Sangmo-ri was established by the families, and the memorial stone inscribed with Baekjoilson (meaning that more than 100 ancestors were killed on the same spot and the same day and as such became one)… a painful legacy of strife in the 20th century. Though the people of Jeju have undoubtedly suffered, the words written on the memorial stone in Bukchon — Co-existence, Peace, Prosperity — ring true. There is hope for the future and a promise to keep to the ancestors. ​Public transportation: From Jeju Intercity Bus Terminal catch bus 782 and get off at Changcheonri bus stop. Transfer to bus 702 and get off at the Sagyeriseodong bus stop. Total travel time is about 1 hour 38 minutes. Apart from the tragedy of the April 3rd Incident, it was during this time that the Korean War broke out. Individuals were put on blacklists, taken into custody or even executed. Anyone already in custody related to the 4.3 was subjected to summary convictions and execution. Many of the victims’ bodies were never found. ​According to the police documents from Jeju, some 1,120 people were in preventive custody in August 1950 in the island’s four police stations. Most were executed at Jeju Port, put in front of a firing squad in Seogwipo, the air field in Jeju, or at Seotal Oreum near Songaksan Mountain on July 29, August 4 and August 20. On the latter date, some 250 islanders were detained at a grain storehouse in Moseulpo and executed and buried near Seotal Oreum. 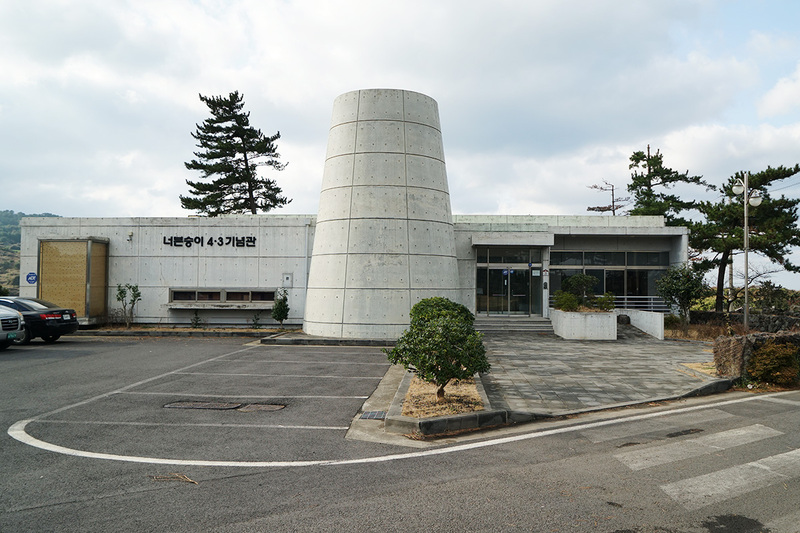 It wasn’t until March 1956 that families of the 61 victims detained at a police station in Hallim were discovered and reinterred in the Manbengdui community cemetery in Geumak-ri, Hallim-eup. Public transportation: From Jeju Intercity Bus Terminal catch bus 960 and get off at Dongmyeong-ri bus stop. Transfer to the 961 and get off at the Gorim-dong bus stop. Total travel time is about 1 hour and 38 minutes.